When you need to generate a voltage between -10 and +10 volts, this board will do the job. With a resolution of 4.9mV (12-bit) and current as high as 5mA, it is designed to interface with devices that are controlled by an analog voltage signal. To use it, simply plug it into a VINT port and control the voltage with your program (See the Connection & Compatibility tab for a list of VINT Hubs). It will also launch an event when the actual output voltage varies from the chosen voltage (for example, when the attached device is drawing too much current). This Phidget is factory calibrated to ensure output accuracy. Need higher resolution? 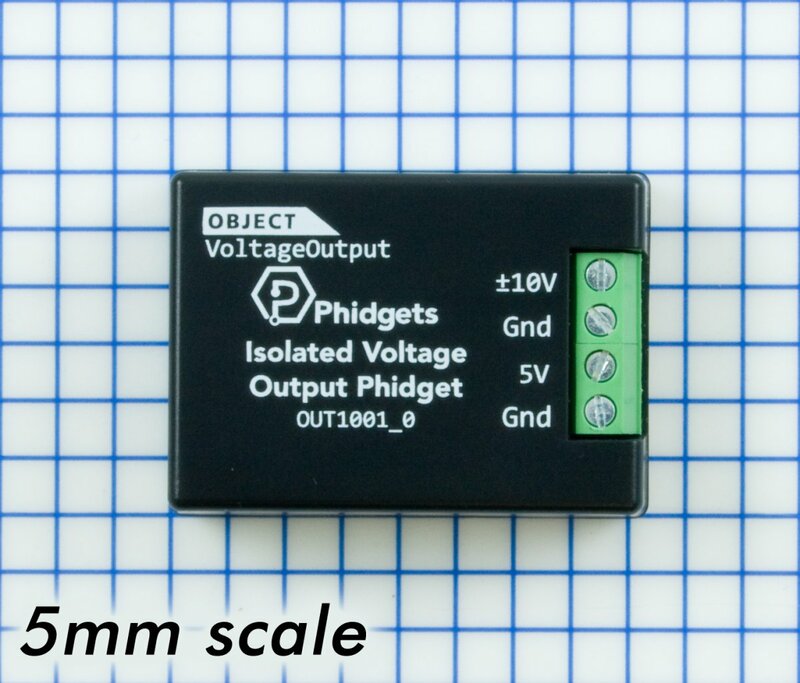 The output on this Phidget also has a 0 to 5V terminal that can be used instead of the ±10 terminal, yielding a resolution of 1.2mV. Both terminals are controlled as the same object in software; they cannot be controlled separately. This board is electrically isolated from input to output, protecting your system fom instability caused by unintentional ground loops. If you need update speed more than isolation or voltage range, have a look at the VINT 12-bit Voltage Output 4V. 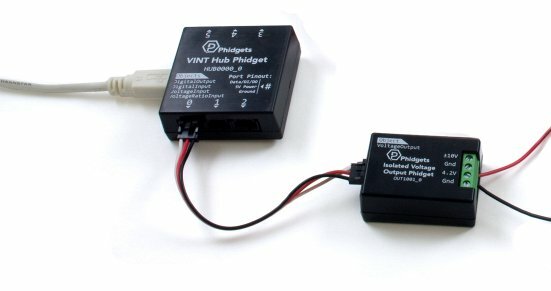 Connect the OUT1001 to the VINT Hub using the Phidget cable. Now that you have everything together, let's start using the OUT1001! 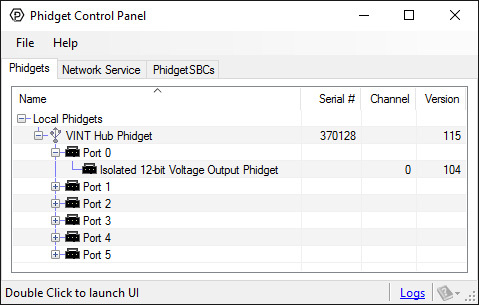 In order to demonstrate the functionality of the OUT1001, the Phidget Control Panel running on a Windows machine will be used. Linux users can follow the getting started with Linux guide and continue reading here for more information about the OUT1001. Set the output voltage by dragging the Voltage slider. Select the Voltage Output Range from the drop-down menu. You can choose between 0-5V output or ±10V output. 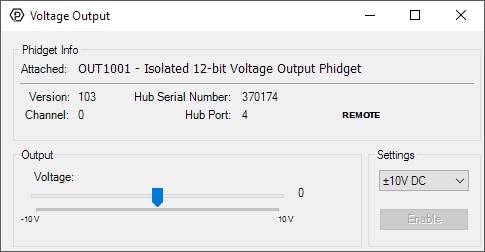 This Phidget is compatible with the VoltageOutput Examples. Some devices may require an analog voltage as a control input. The OUT1001 supplies a fixed voltage up to ±10V, which can be used to control such devices. In addition, this device is isolated and can apply its voltage anywhere in an application circuit, independent of USB ground. The OUT1001 may have an unpredictable output voltage for a very short time immediately after the device changes modes, or is turned on. If this is a problem in your application and you have no way to ignore it via software, we recommend using a solid state relay to switch the output on once it has stabilized. 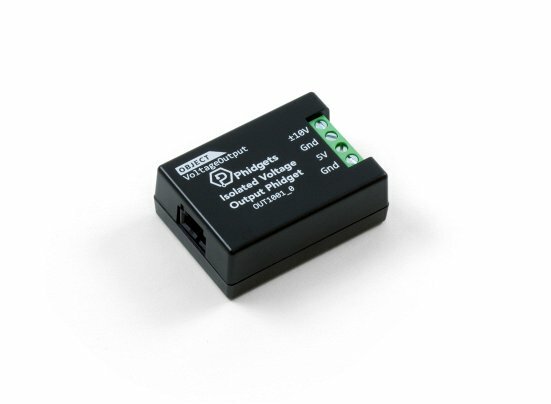 To ensure maximum voltage precision across the device's full range, the OUT1001 Phidget should be subjected to a minimal current draw, ideally less than 5mA in ±10V mode. 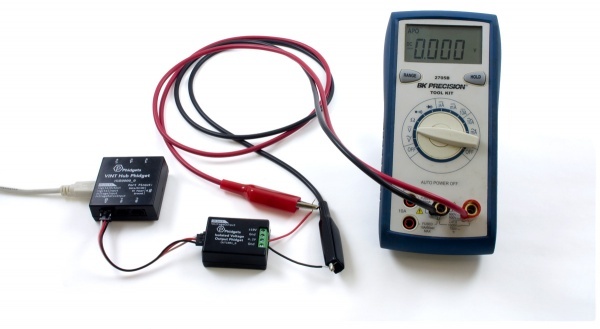 5V mode should only be used to set a voltage in high-impedance applications. However, in the event you plan to power a small load with this device, it will either be sourcing or sinking current when in use. 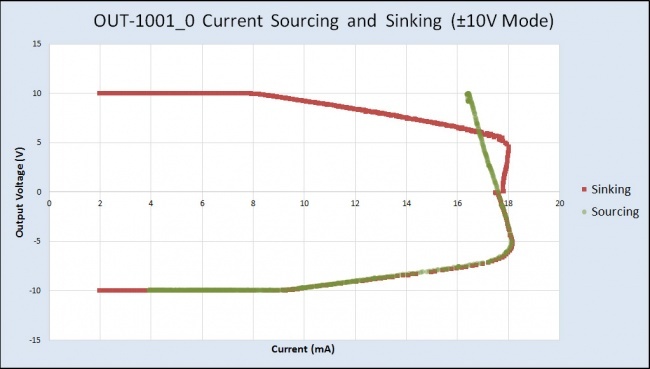 When it's connected to a circuit with a lower voltage potential than its own voltage setting, current will be flowing out from the OUT1001 into the circuit, so it will be sourcing current. 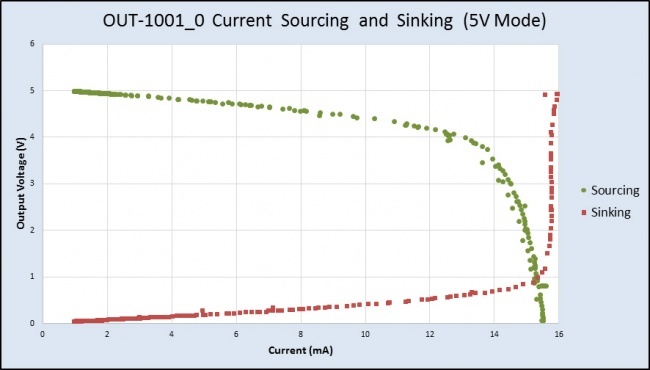 When it's connected to a circuit with a higher voltage potential than the voltage it's set to, current will flow from the circuit into the OUT1001 for a current sinking situation. The OUT1001 can source or sink up to 18mA of current depending on the selected output voltage and mode. The chart below shows the maximum available voltage for a given expected current draw. For example, if the connected circuit is pulling 13mA of current, the OUT1001 will only be able to provide a maximum of 4V (in 0-5V mode), even if you try to set it to a higher value.